Code folding in SE does not work as expected for the declaration of a cursor in SQL Server. It breaks into two parts, a DECLARE folded, leaves FOR where it was, unfolded, and then folds the SELECT statement separately, which suggests it's not folding a DECLARE ... CURSOR statement, it folds a DECLARE variable statement and a SELECT statement, which is not considered being part of a cursor declaration. EDIT: also, there are all kinds of functions to fold/expand blocks in ranges, at the cursor, or nearest, all of them great, but I miss one dearly. It would be greatly useful to be able to collapse everything except the current block and, of course, each one containing the current one. Thank you. I submitted 2 separate enhancement requests for code coding issues you described. It would be greatly useful to be able to collapse everything except the current block and, of course, each one containing the current one. I believe this feature has been implemented in the release version. Yes, it has, but it's kinda incomplete. Since this is a feature of the SQL Editor and not SQL Assistant, it cannot be triggered using the Command Selector (which is awesome, by the way). 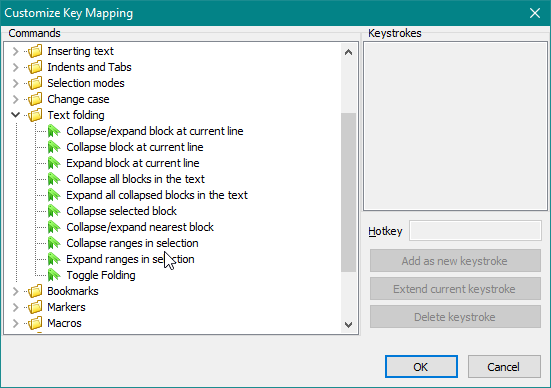 And while it can be reached using Alt+v, a (it's in View menu), it doesn't have its own entry in Key mapping, thus no way to re-map it to another hotkey (sequence). Most of them are already there. Collapse All But Current Block is the only one I miss dearly. I got a word that this will be available in 10.1. Cannot provide specific timing and the exact release date is still unknown.